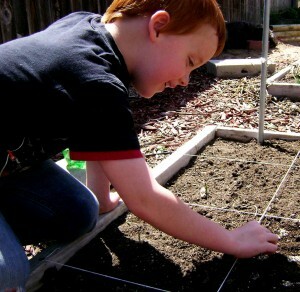 Gavin spent the morning with me the other day and we played in the dirt, or “gardened,” if you prefer. We turned over and amended the soil in one of the 4ft x 4ft raised garden beds. Then to really get the visual, we used string to divide it off into 16 squares. 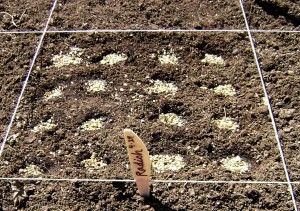 We had alread planted onion sets at the back a couple of weeks ago and they are sprouting up nicely. 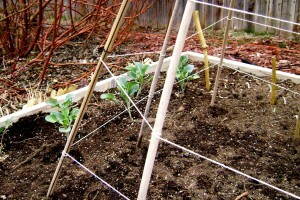 The poles are in place for beans to be planted directly in mid-May. 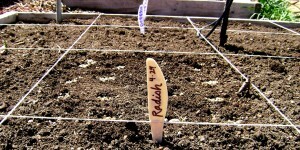 Meanwhile we planted 16 radishes in one 1ft square. We planted a square of carrots, a square of mixed gourmet lettuces and a square of butter head lettuce, with spicy mesclun mixed in around. It will be harvested so young it won’t affect the butter head. We tucked in some nasturium seedlings here and there, which we will use in salads – both the leaf and the flower, and voila! Gavin, who insisted on taking some pictures “so we can remember what we planted,” (how did this boy become such a genius??? ), kept saying to me, “This is a really good day, isn’t it, Nonna?” It sure was! Awwww, those pics are cute! Gavin is a great photographer!